This is a 28mm Major Robert Rogers, sculpted by Dixon Miniatures and painted by me. 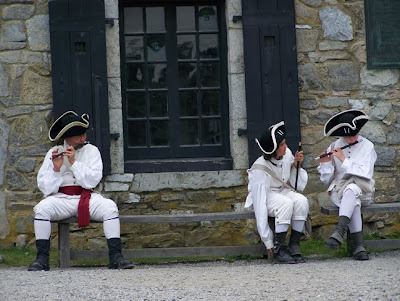 After my visit to Fort Ticonderoga, I have been inspired to paint up some units of French regulars. 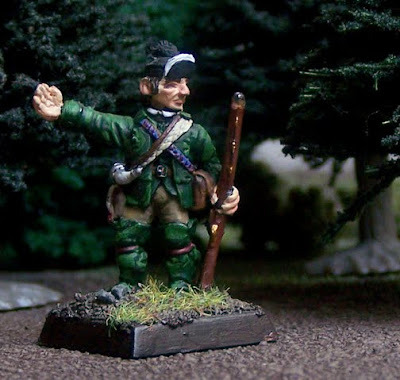 I have my eye on Old Glory Miniatures' French and Indian War line. There aren't too many painted photos of these models visible on the web, so I hope to fill the void. I don't have a ruleset in mind. I think I'm simply going to paint little 10-man units for display. I am restraining myself on making any purchases before my birthday at the end of September! In any case, I can't paint anything until October, because my work schedule has squished my free time. The 1/32 plastic manufacturer, Armies in Plastic, is releasing a new Roger's Ranger's right now. I haven't painted 1/32 in quite a long time, but these French and Indian War toy soldiers are really calling to me. I once had a set of Barzso 1/32 rangers and woodland Indians. I wasn't a fan of the resin, and I didn't like the innaccurate movie-inspired costume for the Rangers. I just got back from visiting my parents in the Adirondacks in upstate NY. 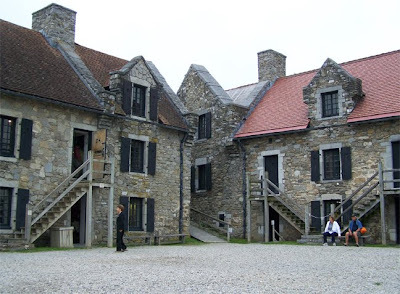 Saturday was a cloudy day (too misty for hanging out at the beach on Lake George), so we drove up to see Fort Ticonderoga on Lake Champlain. 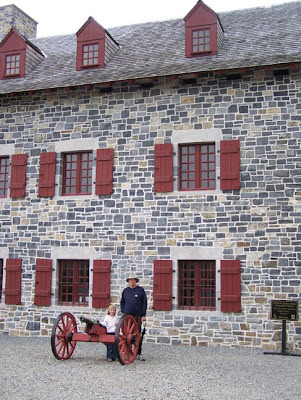 This stone fort was built by the French in 1755-1759. The current museum was constructed on the original footprint to well-researched specifications, duplicating the 18th century structure. 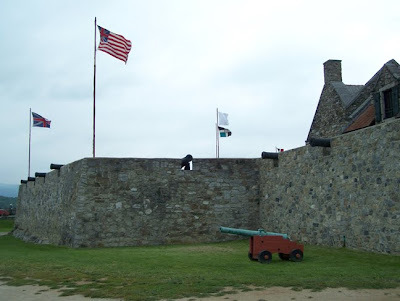 My family has a cabin on nearby Lake George, and my dad is a big colonial history buff, so I have many fond memories of visiting the fort as a kid. I think I last visited about about 15+ years ago. 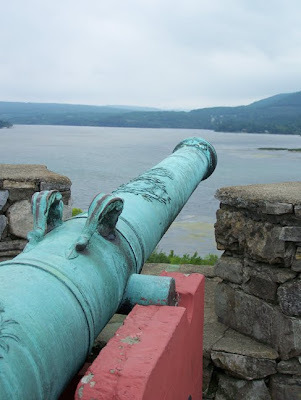 There is an impressive collection of French and English cannons pulled from the lake. 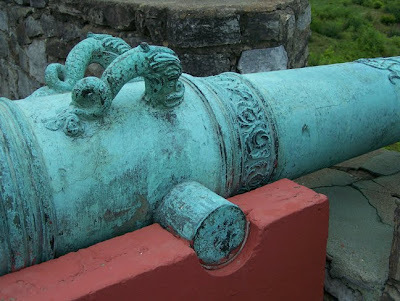 The verdigris on the bronze cannons is really quite eye-catching. 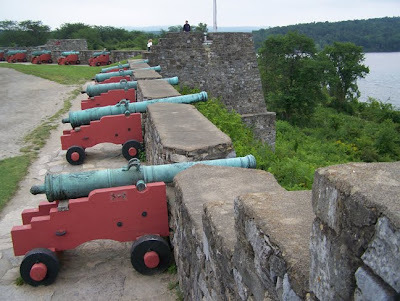 These guns are all mounted on naval carriages, but many of these were actually field pieces. The concrete naval carriage just makes for a more permanent and sturdy mount. The red paint compliments the green cannons quite well, don't you think? The Fort Ti fife and drum corp on break. Here is my daughter and my dad posed by the newly-built blockhouse. Open in 2008, this new construction has filled-in a long-empty space in the courtyard. The interior contains a more contemporary-style museum exhibit, while the older block houses look like 18th century rooms with old shelves of objects. 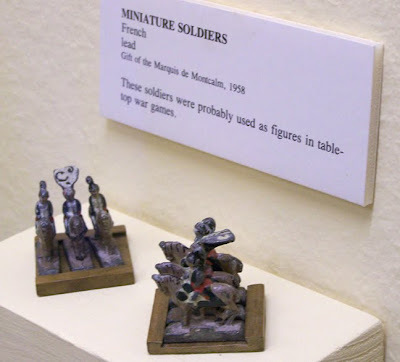 There is no estimated date on the label, but I assume these early tabletop gaming miniatures are from the 1700s. 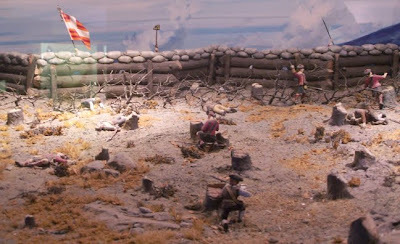 A diorama of the Black Watch storming the French defenses. These models look to be 1/32 scale, but they also have some that are more 28mm. I remember being more impressed by these dioramas when I was a kid. I was looking forward to seeing them, but ended up being more impressed by the Fort's collection of engraved powder horns. I should have taken a photo! After the visit I'm all geared up to paint some French and Indian War figs. Unfortunately, it will have to wait if I stick with 1/72 scale. I hear a rumor that Hat is supposed to have some Seven Years War models in the future. Hopefully, they'll include French and British infantry. Imex has Rogers Rangers in the works, but that is probably years off. I'll have to content myself with the Woodland Indians sold by Italeri and the few 28mm Dixon FIW figs I bought years ago. Chartrand, René. Ticonderoga 1758. Osprey Publishing, 2002.